Krazy Kat is probably the first comic strip I saw that had any real sense of being historical. I'd seen comics in the newspaper before certainly, but those were all contemporary. Even the legacy strips like Blondie had been tweaked and updated enough that, without any frame of reference, you wouldn't know it had started a half century earlier. 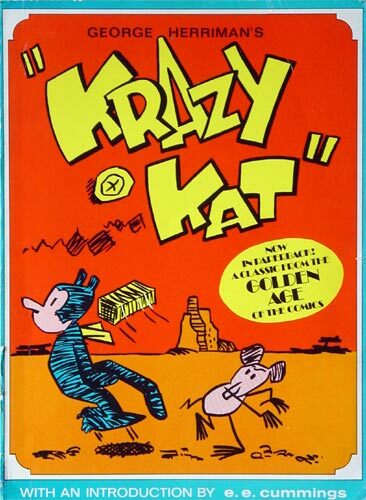 But my dad had a copy of a 1969 reprint of George Herriman's comics entitled simply Krazy Kat. I think he picked it up in college, and I stumbled across it on a bookshelf one day. I must have been at least a teenager by the time I found it, as I recall recognizing the name e. e. cummings, who had written the foreword. That it was a reprint must have piqued my interest because I'm certain that I would have come across Lee J. Ames' How To Draw 50 Famous Cartoons earlier than that and was at least nominally aware of comic strips' history, even if I had seen any of the strips themselves. Still, though, I couldn't have been too far into my teens because I know I had trouble understanding the language. 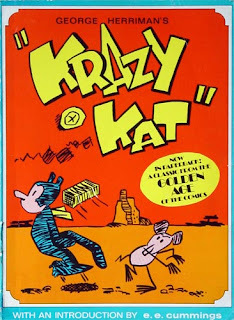 Twenty years ago, a celebration happened-the celebration of Krazy Kat by Gilbert Seldes. It happened in a book called The Seven Lively Arts; and it happened so wisely, so lovingly, so joyously. that recelebrating Krazy would be like teaching pen- guins to fly. Penguins (as a lot of people don’t realize) do fly not through the sea of the slry but through the sky of the sea-and my present ambition is merely. with our celebrated friend's assistance, to show how their flying affects every non-penguin. What concerns me fundamentally is a meteoric burlesk melodrama, born of the immemorial adage love will find a way. This frank frenzy (encouraged by a strictly irrational landscape in perpetual metamorphosis) generates three protagonists and a plot. Two ofthe protagonists are easily recognized as a cynical brick-throwing mouse and a sentimental policeman-dog. The third protagonist-whose ambigu- ous gender doesn't disguise the good news that here comes our heroine-may be described as a humbly poetic, gently clownlilte, supremely innocent, and illimitably afiectionate creature (slightly resembling a child's drawing of a cat. but gifted with the secret grace and obvious clumsiness of a penguin on terra firma) who is never so happy as when egoist mouse, thwarting altruist-dog, hits her in the head with a brick. Dog hates mouse and worships “cat." mouse despises “cat" and hates dog, cat" hates no one and loves mouse. Ignatz Mouse and Offissa Pupp are opposite sides of the same coin. Is Offissa Pupp kind? Only in so far as lgnatz Mouse is cruel. If you're a twofisted. spineless progressive (a mighty fashionable stance nowadays) Olfissa Pupp. who forcefully asserts the will of socalled society, becomes a cosmic angel; while lgnatz Mouse, who forcefully defies society's socalled will by asserting his authentic own, becomes a demon of anarchy and a fiend of chaos. But if -- whisper it -- you're a 100% hidebound reactionary, the foot's in the other shoe. Ignatz Mouse then stands forth as a hero, pluckily struggling to keep the flag of free-will flying; while Offissa Pupp assumes the monstrous mien of a Goliath, satanically bullying a tiny but indomitable David. Well. let's flip the coin-so: and lo! Offissa Pupp comes up. That makes Ignatz Mouse "tails." Now we have a hero whose heart has gone to his head and a villain whose head has gone to his heart. This hero and this villain no more understand Krazy Kat than the mythical denizens of a two-dimensional realm understand some three-dimensional intruder. The world of Offissa Pupp and Ignatz Mouse is a knowledgeable power-world. In terms of which our unknowledgeable heroine is powerlessness personified. The sensical law of this world is might makes right, the nonsensical law of our heroine is love conquers all. To put the oak in the acorn: Ignatz Mouse and Offissa Pupp (each completely convinced that his own particular brand of might makes right) are simple-minded. Krazy isn't -- therefore, to Offissa Pupp and Ignatz Mouse, Krazy is. But if both our hero and our villain don't and can't understand our heroine, each of them can and each of them does misunderstand her differently. To our softheaded altruist. she is the adorably helpless incarnation of saintliness. To our hardhearted egoist, she is the puzzlingly indestructible embodiment of idiocy. The benevolent overdog sees her as an inspired weakling. The malevolent undermouse views her as a born target. Meanwhile Krazy Kat, through this double misunderstanding, fulfills her joyous destiny. Let's make no mistake about Krazy. A lot of people "love" because. and a lot of people "love" although, and a few individuals love. Love is something illimitable; and a lot of people spend their limited lives trying to prevent anything illimitable from happening to them. Krazy, however, is not a lot of people. Krazy is herself. Krazy is illimitable -- she loves. She loves in the only way anyone can love: illimitably. She isn’t morbid and she isn’t long-suffering; she doesn’t "love" someone because he hurts her and she doesn't "love" someone although he hurts her. She doesn't, moreover, "love" someone who hurts her. Quite the contrary: she loves someone who gives her unmitigated joy. How? By always trying his limited worst to make her unlove him, and always failing -- not that our heroine is insensitive (for a more sensitive heroine never existed) but that our villain’s every effort to limit her love with his unlove ends by a transforming of his limitation into her illimitability. If you're going to pity anyone, the last anyone to pity is our loving heroine, Krazy Kat. You might better pity that doggedly idolatrous imbecile, our hero; who policemanfully strives to protect his idol from catastrophic desecration at the paws of our iconoclastic villain -- never suspecting that this very desecration becomes, through our transcending heroine, a consecration; and that this consecration reveals the ultimate meaning of existence. But the person to really pity (if really pity you must) is Ignatz. Poor villain! All his malevolence turns to beneficence at contact with Krazy’s head. By profaning the temple of altruism, alias law and order, he worships (entirely against his will) at the shrine of love. I repeat: let’s make no mistake about Krazy. Her helplessness, as we have just seen, is merely sensical -- nonsensically she's a triumphant, not to say invincible, phenomenon. As for this invincible phenomenon's supposed idiocy, it doesn't even begin to fool nonsensical you and me. Life, to a lot of people, means either the triumph of mind over matter or the triumph of matter over mind; but you and I aren't a lot of people. We understand that just as there is something -- love -- infinitely more significant than brute force, there is something -- wisdom -- infinitely more significant than mental prowess. A remarkably developed intelligence impresses us about as much as a sixteen inch bicep. If we know anything, we know that a lot of people can learn knowledge (which is the same thing as unlearning ignorance) but that none can learn wisdom. Wisdom, like love, is a spiritual gift. And Krazy happens to be extraordinarily gifted. She has not only the gift of love, but the gift of wisdom as well. Her unknowledgeable wisdom blossoms in almost every episode of our meteoric burlesk melodrama; the supreme blossom, perhaps, being a tribute to Offissa Pupp and Ignatz Mouse -- who (as she observes) are playing a little game together. Right! The game they're playing, willy nilly, is the exciting democratic game of cat loves mouse; the game which a lot of highly moral people all over the so-called world consider uncivilized. I refer (of course) to those red-brown-and-black-shirted Puritans who want us all to scrap democracy and adopt their modernized version of follow the leader -- a strictly ultraprogressive and superbenevolent affair which begins with the liquidation of Ignatz Mouse by Offissa Pupp. But (objects Krazy, in her innocent democratic way) Ignatz Mouse and Offissa Pupp are having fun. Right again! And -- from the Puritan point of view -- nothing could be worse. Fun, to Puritans, is something wicked: an invention of The Devil Himself. That's why all these superbenevolent collectivists are so hyperspinelessly keen on having us play their ultraprogressive game. The first superbenevolent rule of their ultaprogressive game is thou shalt not play. If only the devilish game of democracy were exclusively concerned with such mindful matters as ignorance and knowledge, crime and punishment, cruelty and kindness, collectivists would really have something on the ball. But it so happens that democracy involves the spiritual values of wisdom, love, and joy. Democracy isn't democracy because or although Ignatz Mouse and Offissa Pupp are fighting a peaceful war. Democracy is democracy in so far as our villain and our hero -- by having their fun, by playing their brutal little game -- happen (despite their worst and best efforts) to be fulfilling our heroine's immeasurable destiny. Joy is her destiny: and joy comes through Ignatz -- via Offissa Pupp; since it’s our villain's loathing for law which gives him the strength of ten when he hurls his blissyielding brick. Let's not forget that. And let's be perfectly sure about something else. Even if Offissa Pupp should go crazy and start chasing Krazy, and even if Krazy should go crazy and start chasing Ignatz, and even if crazy Krazy should swallow crazy Ignatz and crazy Offissa Pupp should swallow crazy Krazy and it was the millennium -- there'd still be the brick. And (having nothing else to swallow) Offissa Pupp would then swallow the brick. Whereupon, as the brick hit Krazy. Krazy would be happy. Alas for sensical reformers! Never can they realize that penguins do fly, that Krazy's idiocy and helplessness in terms of a world -- any world -- are as nothing to the nth power, by comparison with a world's -- any world's -- helplessness and idiocy in terms of Krazy. Yet the truth of truths lies here and nowhere else. Always (no matter what’s real) Krazy is no mere reality. She is a living ideal. She is a spiritual force, inhabiting a merely real world -- and the realer a merely real world happens to be, the more this living ideal becomes herself. Hence -- needless to add -- the brick. Only if, and whenever, that kind reality (cruelly wielded by our heroic villain, Ignatz Mouse, in despite of our villainous hero. Offissa Pupp) smites Krazy -- fairly and squarely -- does the joyous symbol of Love Fulfilled appear above our triumphantly unknowledgeable heroine. And now do we understand the meaning of democracy? If we don’t, a poet-painter called George Herriman most certainly cannot be blamed. Democracy, he tells us again and again and again, isn't some ultraprogressive myth of a superbenevolent World As Should Be. The meteoric burlesk melodrama of democracy is a struggle between society (Offissa Pupp) and the individual (Ignatz Mouse) over an ideal (our heroine) -- a struggle from which, again and again and again, emerges one stupendous fact: namely, that the ideal of democracy fulfills herself only if, and whenever, society fails to suppress the individual. Could anything possibly be clearer? Nothing -- unless it's the kindred fact that our illimitably affectionate Krazy has no connection with the old-fashioned heroine of common or garden melodrama. That prosaically "virtuous" puppet couldn’t bat a decorously "innocent" eyelash without immediately provoking some utterly estimable Mr. Righto to liquidate some perfectly wicked Mr. Wrongo. In her hyperspineless puritanical simplicity, she desired nothing quite so much as an ultraprogressive and superbenevolent substitute for human nature. Democracy's merciful leading lady, on the other hand, is a fundamentally complex being who demands the whole mystery of life. Krazy Kat -- who, with every mangled word and murdered gesture, translates a mangling and murdering world into Peace And Good Will -- is the only original and authentic revolutionary protagonist. All blood-and-thunder Worlds As Should Be cannot comprise this immeasurably generous heroine of the strictly unmitigated future. She has no fear -- even of a mouse.